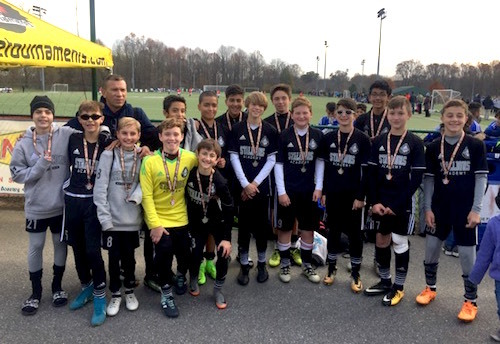 The U14B NJ Stallions 04 Roma EDP boys team traveled to Maryland to the 2017 Columbia Fall Classic and finished as FINALISTS after 4 competitive matches in two days. Over four games including the Final, the 04 Roma boys scored 9 goals, allowing 5. The first 3 matches were victories over 3 very strong Maryland boys programs; 4-1 vs SAC 04 Premier White, 3-2 over MSC Academy 04, 1-0 over ASA Rangers MD. The final was a well fought game against SAC United Blue 1-2L. Coach Jimmy RIvas is extremely proud of his players' efforts. The 04 Roma EDP boys look forward to a productive indoor winter training season at the NJ Stallions Academy home indoor facility, Stallions Arena.